Limited edition X-Force white color scheme. 10 1/2-inch tall action figure sports interchangeable hands and faces. Possible poses range from his mischievous gestures to his powerful action stances! Even within the Marvel universe, Deadpool stands out. Comical, expressive, and now appearing as a Variant Play Arts Kai action figure in this limited edition color scheme inspired by his X-Force costume. This Deadpool is all about white. A light inner gray layer is implemented to create a vivid contrast and ensure that the top white coat stands out, so the color design of this figure glistens in white all around. Wear and tear from high intensity battles is expressed through weathering effects and the use of dry brushes to emanate Deadpool's kinetic energy. With a wide range of motion, plus interchangeable facial and hand accessory parts that enable a variety of expressions, this figure's possible poses range from his mischievous gestures to his powerful action stances! 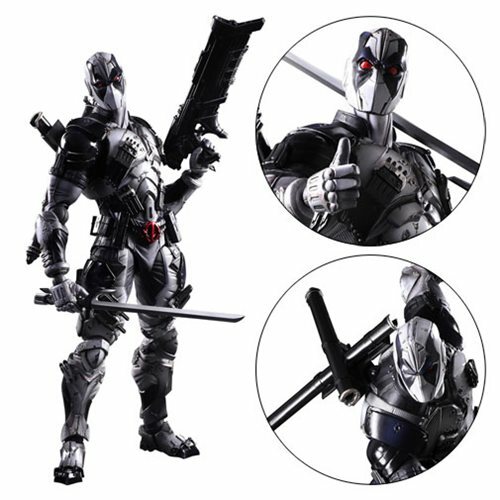 The plastic Marvel Universe X-Force Deadpool Play Arts Kai Variant Action Figure measures about 10 1/2-inches tall, includes a display stand, and comes packaged in a window box. Ages 15 and up.